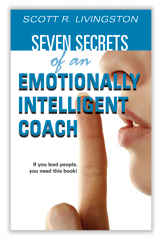 We published the client's book Seven Secrets of a Emotionally Intelligent Coach. This proved to be a key in opening doors at high level corporations. We also produced an interactive workbook for use in retaining his clients. This included videos that introduced each subject, case studies, worksheets all on a secured web site. Project: This consulting group wanted to get in front of decision makers at Fortune 500 corporations. One of the most important actions of marketing is to open doors for sales. That is what we did for this client. LCG is an executive coaching and consulting group. Business coaching is a highly competitive field, especially when you begin to deal with Fortune 500 companies. The founder of this company came out of the pharmaceutical industry to start LCG in his home office. He needed a way to differentiate himself from the pack of other consultants that clutter the entryways of corporations trying to get a foot in the door of the executive wing. We needed something that was totally different than what his competition was doing. The founder of LCG had a lot of wisdom and common sense - not often a combination found in the business coaching industry. He also had become an expert in the emerging field of Emotional Intelligence. What he did not have was a large following of people who recognized him as an expert. If he was known, it was as a sales trainer for some of the most successful people in his former company. He needed credibility to perform this new role. He asked us to produce a brochure and a web site. We decided what he really needed was a book and a way to turn his methods into an interactive experience. First, we helped him publish a book on his core competencies. We provided a writer/editor that helped him produce the book in six weeks. This proved to be a great calling card that opened all kinds of doors. While his competitors were dropping brochures and power point presentations, his contacts were reading his book. The book opened the doors, but we needed a marketing piece that would help LCG retain these customers. Next, we developed an interactive online workbook for his clients. This included assessment tools, case studies and exercises that were personalized for each client. Our web designers and programmers put together a site that was easy for the client to use remotely in between the times he interacted face-to-face with his customers. Each of his core competencies were introduced with a short, humorous video which we produced. As a result, the client was able to establish long term contracts with key corporations in his target group. Take a look at the web site.